Blood Oath by Christopher Farnsworth, a Mysterious Review. 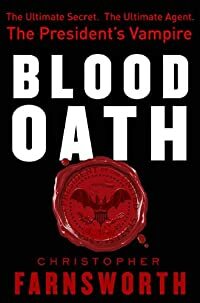 Review: Christopher Farnsworth introduces Nathanial Cade, a vampire in eternal service to the office of the President of the United States, and his new handler Zach Barrows, in the supernatural thriller Blood Oath. Cade was convicted of murder and sentenced to die in 1867 when President Andrew Johnson pardoned him. In return, he agreed to "defend this nation against the threats from the Other Side." Cade, being immortal, has had a succession of liaisons since then, and his new one is the cocky, but political savvy, Zach. His predecessor tells him, "Someone has to be there to hold the line. That's what we do. We fight every incursion they make. They invade, we repel. Forget the War on Terror, Zach. This is the War on Horror. And you've just been drafted." Zach doesn't have time to get acclimated in his new role when an old nemesis of Cade's resurfaces — intent on building an army of the undead to do his bidding. But towards what end, not even Cade knows … or is willing to wait to find out. In setting the stage for a vampire-based thriller, Farnsworth gets a lot right in Blood Oath, most notably humanizing (no pun intended) Cade, giving him an appealing James Bond-type persona with somewhat ambiguous morals. He even has gadgets. Zach's initial impression of Cade is the 19th century one immortalized in fiction, but when Cade opens a black nylon case revealing an array of electronic gizmos, Zach grins. "Sweet. Finally some superspy tech." The author also successfully taps into the notion that the US government operates several super-secret, off-budget organizations, and protects its citizens by keeping them in the dark on matters that are deemed to be too challenging for mere mortals, as it were, to understand. Many chapters open with clips from a variety of documents, some "classified", that lend an air of authenticity to the story. But the fun doesn't last. About midway through, Blood Oath rapidly loses a lot of steam. Some of the characters introduced early are never fully realized, and seem to be included in scenes that are merely filler, not even transitional. Furthermore, what initially is plausible increasingly becomes preposterous, silly even. And the plot, which is so tautly scripted at the start, gets more clumsy as the story draws to a climactic close. In the end, the author seems so intent on keeping his options open for a sequel that a lot of questions are left unanswered and little is actually resolved. Many readers might even think a concluding chapter or two that ties up some loose ends was inadvertently omitted. Farnsworth is also a screenwriter and as a consequence there are a lot of terrific visuals here, so it's no surprise that the film rights to Blood Oath were optioned before its publication. Still, even though Cade and Zach make for a strong, appealing team, a movie is typically only as good as its story, and unfortunately that's the weakest element here. Acknowledgment: Goldberg McDuffie Communications provided a copy of Blood Oath for this review.